New signings Jefferson Lerma and Diego Rico completed 90 minutes for the AFC Bournemouth under-21s away at Griffin Park. Fellow first team players Tyrone Mings, Marc Pugh, Mark Travers and Jack Simpson also played the full game which saw the Cherries defeated 2-1. Lerma was playing in his first game since the World Cup last-16 fixture against England, while Rico was taking part in his first fixture since the Cherries' home friendly with Real Betis. And it didn't take long for the Spaniard to get going, playing several incisive passes in an industrious display, where he combined well with Pugh at times, in particular in the first-half. The hosts had a number of chances to go ahead, with Mark Travers forced into action to tip away a Reece Cole effort from long-range. Pugh then could have had a goal just after the half-hour mark. A superb pass by Rico in the left-back area cut Brentford apart and Pugh went racing through on goal, he chopped past the final defender in the penalty area but forced an excellent save from the home stopper. Shortly afterwards, Pugh almost turned provider for Rico, with the winger picking out the Spaniard who fizzed a vicious volley which whizzed narrowly over inside the penalty area. 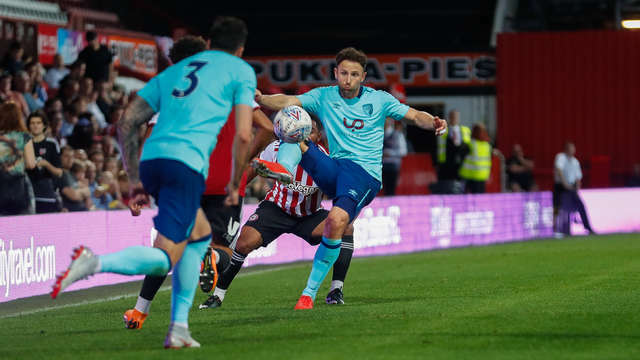 Brentford did create openings themselves, with skipper for the evening Simpson forced into two impressive blocks to keep the score level. But four minutes after the interval, the hosts did take the lead when Marcus Forss shimmied into the area and found the bottom corner. Some neat passages of play couldn't create any clear-cut openings for the Cherries, and they were 2-0 down on the hour mark when Cole tapped in from close range. But Carl Fletcher's side began to get into their stride after the second goal, and got themselves back in the game seven minutes later. Jaidon Anthony drilled a lovely first-time strike into the bottom corner in the area after good work from Pugh - Anthony's goal was a precise effort which galvanised the Cherries. Despite some late pressure, the visitors couldn’t find an equaliser in a good workout which saw five outfield first-team players gain valuable minutes. Our under-21s are proudly sponsored by Utility Point. Click here to find out more about them. Match report photos courtesy of Mark Fuller / Brentford FC.